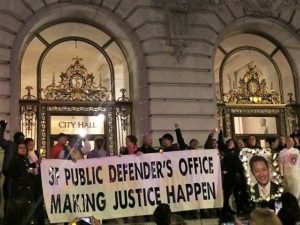 On February 26, 2019, the San Francisco Board of Supervisors unanimously passed the “Jeff Adachi Youth Rights” ordinance, which prohibits custodial police interrogations of youth 17 years of age or younger, unless certain conditions are first met. These conditions include: (1) providing the youth legal representation in connection with the interrogation, and (2) requiring that responsible adults be given access to the youth during police questioning. The right to a legal consultation cannot be waived by the youth. This ordinance expands upon SB 395 (effective Jan. 1, 2018), which mandated that youths 15 years of age or younger consult with legal counsel prior to a custodial interrogation or a waiver of Miranda rights. San Francisco’s ordinance only applies to youth within the county’s jurisdiction. It is PJDC’s hope that this expansion of the right to a legal consultation of all youth also be replicated in all 58 counties in California.